Creating an institution of excellence! This is a truly incredible time to be a part of the UNA Theatre Program. We are entering a new era in the program's continuing development and big opportunities are presenting themselves at every turn. The Summer Theatre program has returned to UNA bringing in professional artists to work with our students. Our graduates continue to thrive in their internships, graduate programs and professional careers as professional artists & technicians and as faculty across the USA. Bachelor of Arts Degree in Theatre with concentrations in Acting, Design/Tech, and General Theatre. 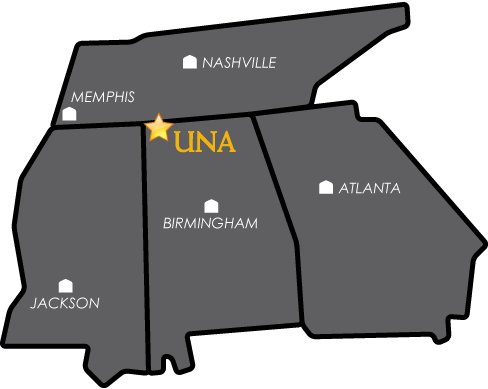 The UNA Theatre Program offers aspiring theatre students many opportunities to experience theatre education at its finest. For instance, UNA Theatre provides the possibility for students to direct and design full-length plays on our main stage season, an opportunity rarely available to undergraduate theatre artists. We can do this because we are an undergraduate program that serves the educational needs of only undergraduates, free from the overwhelmingly competitive environment associated with schools containing graduate programs. And our approach to theatre education and training is very successful. Our students are being accepted into top graduate programs and internships and finding professional careers all across the country. But most important, at UNA, our students are not just faces in the crowd — they are active members of our theatrical family. As such, we not only encourage students to participate in the curriculum and performances, we welcome them as valuable assets of UNA's Theatre Program. We believe that an effective theatre training curriculum must blend classroom studies with practical and challenging experiences that encourage students to grow in skill and talent. We believe in a curriculum that provides students with a strong base in all major areas of theatre study in preparation for advanced instruction in acting, directing, design/tech, arts management and theory/criticism. We believe in instruction and advisement that will prepare our students for the challenges of graduate and conservatory programs as well as careers in the professional and educational sectors of theatre. We believe our students must be effective communicators -- orally, literally, visually and within a variety of artistic contexts. We believe that a strong résumé must be built upon a classroom and performance environment that exposes students to eclecticism and multiculturalism. We believe that a theatre program not only teaches student artists how to perform but must also enlighten student audience members in the theatrical process to encourage the growth and development of future audiences that will strive to support the art of the live theatre.